Sometimes I take recipe requests. 😉 When a friend of mine asked me to create a grain-free version of some key lime white chocolate cookies, I couldn’t resist! But I decided to go in a very different direction to make them mini “cheesecakes” of puréed cashews. They’re a no-bake treat in addition to being dead simple and grain-free, because who wants to turn the oven on in the summer? Or wait and watch to make sure your baked dessert doesn’t burn? Not me. I love the spoon-it-out-and-freeze strategy when making treats, maybe you do too. 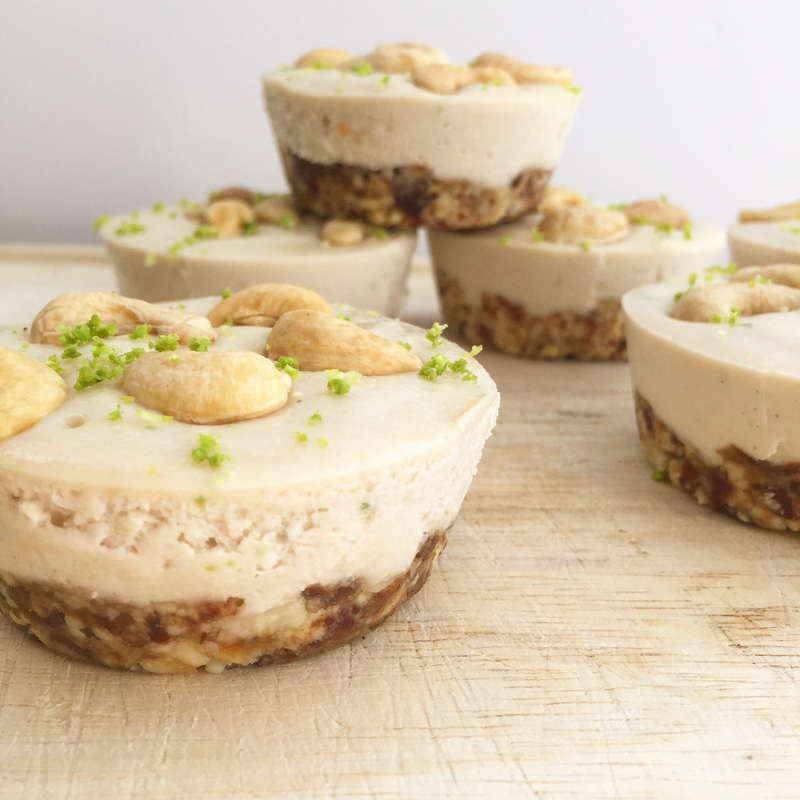 These mini key lime pie cheesecakes balance the creaminess of coconut milk with the natural sweetness of cashews, finished with the faintest tart flavor of lime. One note about key limes, while we’re on the topic: they have a slightly different flavor, leaning just a bit toward that of an orange, and are considered less sour than the more commonly available Mexican limes. However, with the addition of the other ingredients in this recipe, regular lime juice and zest will work just as well and be just as delicious. These mini key lime pie cheesecakes look fancy, taste fancy but are so simple to whip up. They’re a healthy dessert choice and take less than 10 minutes to make once the cashews have been soaked. When they’re finished and frozen, I let them soften for about 10 minutes on a plate at room temperature before serving. And now, mini key lime pie cheesecakes! 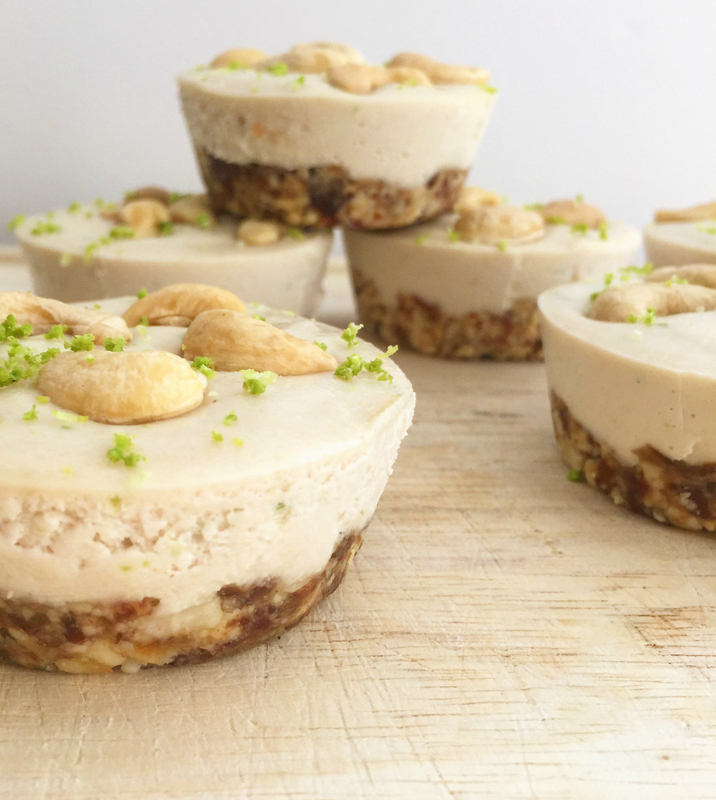 These sweetly creamy cashew key lime pie "cheesecakes" are a simple, no-bake, frosty dairy-free treat without refined sugar. To make the crust: pulse 1 cup of the cashews with the dates and 1 tablespoon of coconut oil into a coarse paste. Divide between 9 cups in a muffin tin, pressing crust firm and flat with your fingers. To make the filling: soak 1 cup of the cashews for 4-6 hours, drain, then purée until smooth with the coconut milk, ⅓ cup of coconut oil, the maple syrup and lime juice. Divide evenly over the crusts. Top with cashews and lime zest if desired, freeze until firm (minimum 1 hour). To serve, let the cheesecakes stand at room temperature for five minutes, then work a knife around the perimeter until the cheesecakes loosen. Enjoy chilled. Yummy and healthy, the best of both worlds. I think nuts are such a great substitute for dairy products. These look and sound to be amazing! I know my hubby would love them! Thank you for sharing! I know, such a cool concept. Cashews, who knew? I love key lime recipes and can’t wait to try your version. These look so good and I can not wait to try them! These cheesecakes look fantastic! So great for summer! Those look delicious! I love anything key lime. Me too, that perfect pop of sweet in a dessert. Whoa, these look great! Perfect dessert for summer! Thanks for sharing! These sound really yummy and perfect for the summer! Only 6 ingredients!! That is my kind of recipe. Also Key Lime Pie is one of my favorite things! You should make them and tell me how much they actually taste like key lime pie. I can’t remember the last time I had the real thing! Oh, no! Maybe that’s what happens wen they get too melty before eating, did you let them thaw? This looks so healthy. I love this version of one of my favorite desserts! These sound sooo good (and look adorable)! Will you take my request for a delivery of about a dozen to my front doorstep? Love them! I never would have thought to combine cashews and dates for the crust. Looks yummy! Oh my goodness those look super delicious!!! These are so cute! 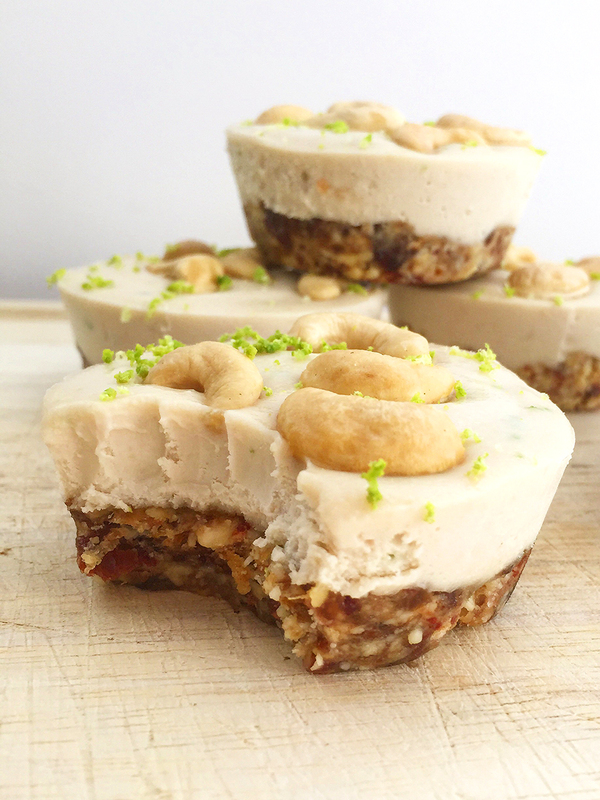 I used to make a lot of sweets with soaked cashews back in my vegan days. I was always amazed by how creamy they can get! While I don’t miss the veganism, I definitely need to get back to making some great cashew treats. Thanks for this fantastic recipe! I had to comment because these look amazing– soo special and yummy!!! Pinned. Great photographs! Awww, thank you! I love cute little desserts. 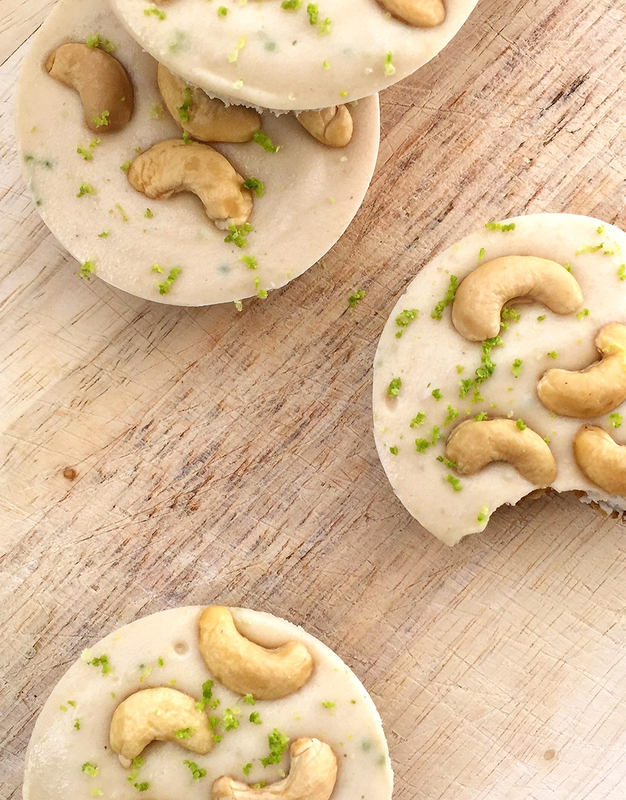 Never thought lime and cashews would go together but this looks like match made in heaven! These are right up my alley!! Love key lime pie. These look great. I can’t eat dairy and have made key lime using oat milk. Not the best. Pinning. Try this! They’re soooooo tasty and easy. I love a good no-bake recipe like this, especially in the summer months! I don’t get key limes where I live but I’m just gonna have to give this a try with regular ones. I love that they’re no bake. These days are just scorching! Wow, then these are perfect for you two! YES!! Love these. Let’s just never turn on our oven. Summer needs all the no bake things. Yep, I definitely think that work. I have a dumb question… are the cashews raw? Or roasted? Or…? Do you use the full-fat coconut milk from a can or the coconut milk from a carton? Thanks. I just made this today, and it’s setting in the freezer right now. From the clean up on the spatula, I can tell it taste fantastic. I used homemade coconut milk that I make from brown coconuts, which helps take the flavor over the top. Great recipe! Wonderful, hope you like the chilled final result! The homemade coconut milk from brown coconuts sounds amazing, btw. When you say 1/3 cup of coconut oil is that solid or melted,?